Rich and creamy white chocolate peppermint cheesecake on top of an Oreo crust crowned with chocolate peppermint ganache—need I say more?! I can’t help myself. I just have to share one more peppermint treat with you before the Christmas holidays! 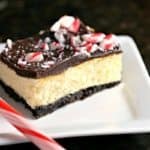 Luckily, this festive dessert satisfies everyone in our household, the cheesecake lover (my hubby) and the chocolate peppermint lover (that would be me!). And best of all, it’s not complicated to make, even with the decadent dark chocolate ganache! 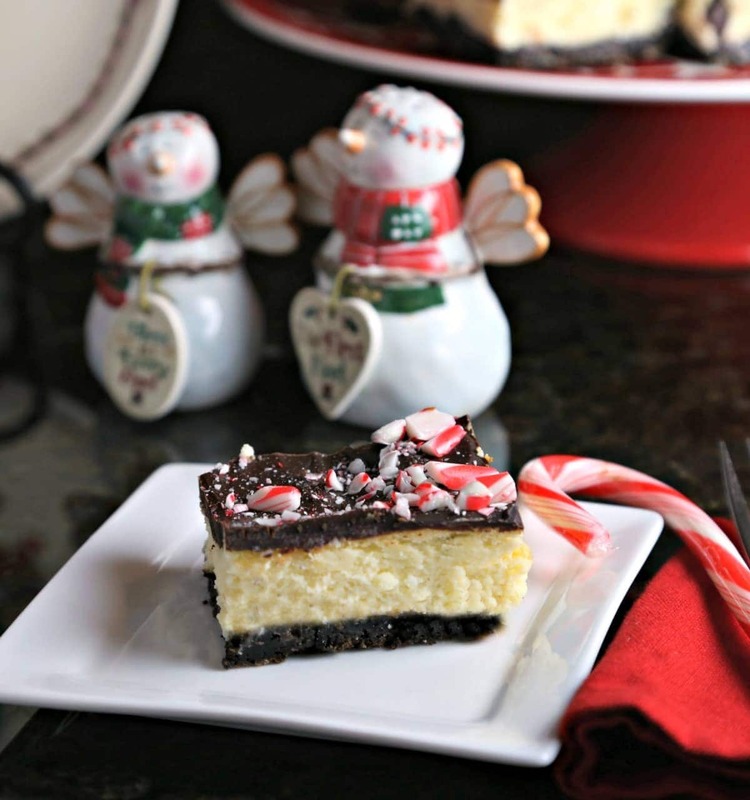 Peppermint Cheesecake Bars have white chocolate in the batter which makes them even creamier and more delicious! With just one short week until Christmas—I can’t believe it’s almost here already—you may have all your baking plans made. But if not, this dessert should definitely be considered. The base is an Oreo cookie crust that’s baked for a few minutes to create a nice crunch before adding and baking the cheesecake layer. Allow the cheesecake to cool completely before topping with the chocolate ganache. Although it’s not entirely necessary, if you have time, refrigerate the cheesecake bars overnight before adding the ganache layer. This way, the ganache will set up quickly once it is spread on the cheesecake bars. Don’t let the chocolate ganache intimidate you. All you need is the right proportion of a good quality baking chocolate bar, like Divine Baking Bar 70% Bittersweet Chocolate, and heavy cream melted together at a low temperature. 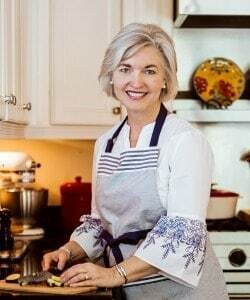 There are several methods for making ganache (in a double boiler, over low heat on the stovetop, or in the microwave), but I think the microwave method works just fine for this recipe. Be sure to heat at 30-second intervals and only at 30 percent power, stirring between intervals, until completely melted and smooth. One the ganache is melted, allow it to cool completely before pouring on top of the cheesecake bars. 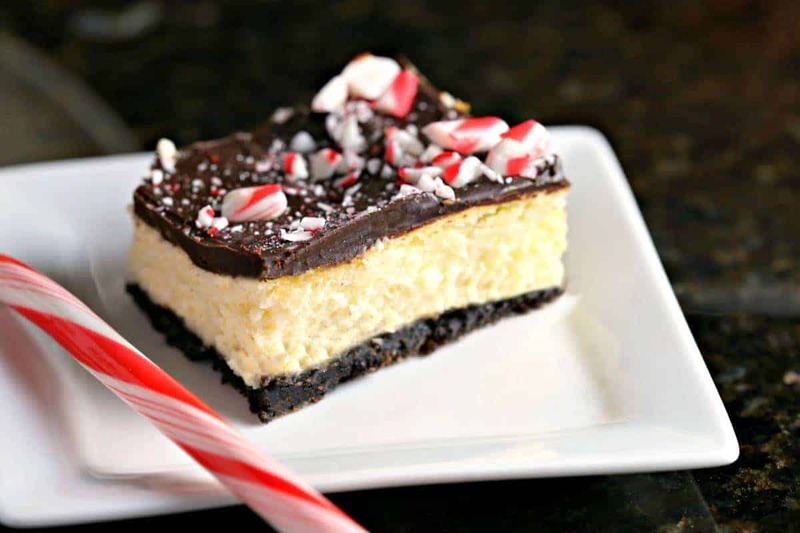 Smooth it out with a small spatula and sprinkle with crushed candy canes before cutting into bars. I refrigerated my Peppermint Cheesecake Bars before cutting them, but found that it was best to allow them to sit out of the refrigerator about 30 minutes before slicing to avoid cracking the ganache layer. Preheat oven to 350 degrees. Line an 8x8 baking pan with parchment, leaving overhang on two sides for lifting out later. Lightly coat remaining sides of pan with baking spray. Pulse cookie crumbs, sugar, and melted butter in food processor. Pour into the prepared pan and press along the bottom to create an even layer. Bake crust for 10 minutes. In a small microwave-safe bowl, melt white chocolate chips in 30 second intervals, at 50% power, stirring until melted and smooth. Using a stand mixer, beat cream cheese until smooth. Gradually add sugar and mix until incorporated. Add melted white chocolate and mix. Next, mix in heavy cream and peppermint extract. Add eggs, one at a time, mixing well between additions and until smooth. Poor batter onto crust and bake for 45 minutes. Cool completely. In a microwave-safe bowl, combine chopped baking chocolate and heavy cream. Microwave at 30 second intervals at 30% power, stirring between each interval, until melted and smooth. Stir in peppermint and vanilla extracts. Allow to cool to room temperature. Pour cooled ganache over top of cooled cheesecake. 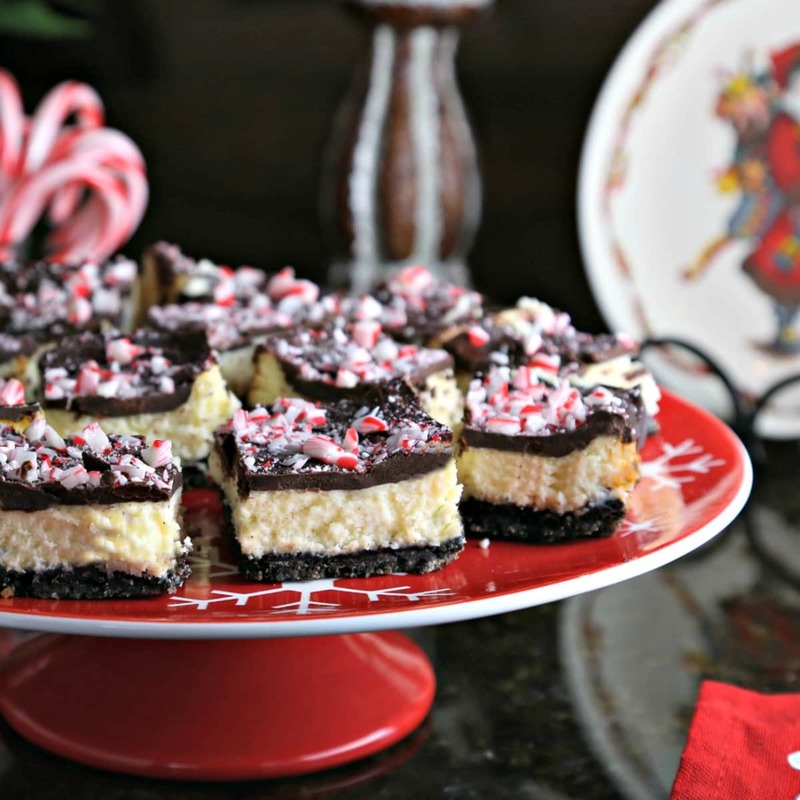 Spread into an even layer and sprinkle top with crushed candy canes. Using a sharp knife, carefully slice cheesecake into desired sizes. 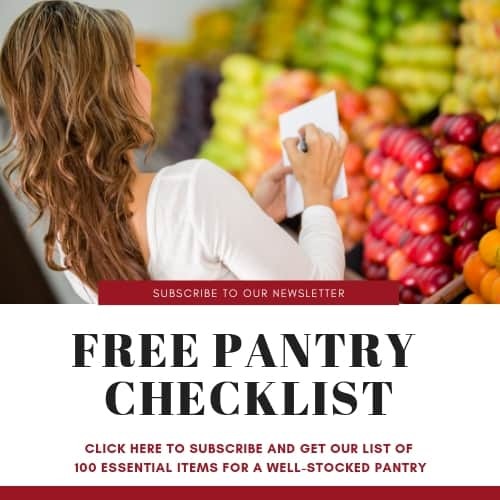 Store cheesecakes in the refrigerator. Every beautiful part of Christmas desserts in one! This looks absolutely amazing… definitely going to be a crowd favorite! Oh, thank you, Karly! Merry Christmas!